“Basically we’re giving [handsets] to you without making any money… we care about the recurring revenue streams over many years,”. “We could sell 10 billion smartphones and we wouldn’t make a single dime in profits,” he added in an interview to Reuters. Xiaomi is doing great in India, but with its exponential growth, there are some concerns that have surfaced over a period of last two years. In this original story, we discuss some of the issues that the brand is facing in India. As we know, Xiaomi has overtaken Samsung in India and has become the number 1 mobile brand. Xiaomi was launched in 2014 in the Indian market, and in the initial days, the brand started with the infamous Flash sales model that it is still continuing. It began its journey with the Mi3, the most affordable flagship phone ever. (Launched at just Rs. 14,999). The Mi3 was a superhit, everyone wanted to buy one. Mr. Manu Kumar Jain recalls that their initial aim was to sell 10,000 phones, but the response was incredible, and they sold lakhs in the flash sales in association with Flipkart. In the past 3 years, the brand slowly became popular with value seekers, and is now a household name in the country. The success mantra for Xiaomi in India is offering great specs at a low price. The majority of sales for Xiaomi comes from Online platforms, and brand boasts that they have over 46.9% share online. Read More on – How Xiaomi became No.1 In India. The online sales help to sell directly to the customer and cut the middleman out. Xiaomi doesn’t have to pay anything to retailers, distributors or the in-store promoters. However, the brand is expanding in retail but is still much smaller in comparison to Samsung or other brands like Vivo or Oppo. So, cutting out the middleman also means a potential loss of thousands of jobs and livelihood for many people. How? Let’s discuss this in-depth subsequently. Also, there is a concentration of wealth, that is only shared by the giants like Flipkart, Amazon, and Xiaomi. While the retailers and distributors are left dry. Xiaomi wants to change this scenario. In fact, it is adding more preferred partners and is said to have over 600 preferred partner stores and the brand wants to take the count over 1500. However, these steps are benefiting larger retailers, who already get the major chunk of business. On the contrary, the smaller ‘Mom and Pop’ stores in the interiors are losing out. We can argue that the customers are getting the products at a lower price and who cares about these small stores. But I think, we also need to understand the pain of lakhs of small retailers who are suffering due to the predatory pricing of Xiaomi. What Are Small Retailers Saying? I recently met around 20 small retailers in Haryana and Punjab who have a shop in tier-3 cities. We started the research couple of days back and after meeting these retailers found out the ground realities these people are facing. They don’t sell Xiaomi phones “officially” due to pathetically low margins, lack of availability, no distributor, and above all, due to the stock issues. Also, the retailers told me there is no official distributor for Xiaomi in their town and they get the phones at MRP from black market suppliers. Moreover, it is true Oppo and Vivo has changed their strategy and reduced the distribution to less number of counters. They have even reduced the retailer margin to 2.5% to 3.0% that is impacting smaller retailers more in comparison to large retail partners. Substantiating the facts, a report in Economic times in Jan 2018, retailer margins were cut by both Oppo and Vivo. The retailers also told me that they are unable to compete with the online discounts and this is impacting walk-in sales. Even most of their old customers now want to buy online. Another big issue with the Xiaomi Phones is the black marketing of the latest models. You can buy the Xiaomi Redmi Note 5 by paying additional Rs. 500 (above MRP). Additionally, you can even get the Redmi Note 5 Pro by paying Rs. 1000 to 1500 above the MRP. I talked with the retailers and they said I will have to wait for sometime, and they can arrange the phone if I am willing to pay the whole amount as cash. When I asked about the distributor supplying the phones, they laughed and told me there is no distributor. We earn more by selling these at the black market rates. I talked with another retailer, who gave a very insightful information. Most people who have cash are buying Xiaomi phones and people who want to use the finance schemes from Bajaj Finance etc. are buying Oppo, Samsung, and Vivo phones. Also, all this is impacting Retailer earnings, and in turn, they are not keeping too many promoters on the shops for sales promotions. Additionally, the number of promoters hired by Samsung, Oppo, Vivo is reduced by the companies to cut costs. There is fall of per outlet sale and productivity of the promoters in the recent times. It is not viable for brands to keep these people on-board if they are not meeting the targets month after month. I even spoke to a Samsung promoter, who tried to first convince me that the J2 Pro with the AMOLED display and Exynos is superior to Xiaomi Redmi Note 5 or Note 4. But when I asked about the bezel-less display and 4000 mAH battery and a faster processor in Xiaomi mobile, he conceded that Samsung is not doing much in the mid-range segment. The retailers still get a lot of customers from rural areas which help drive sales. However, a lot of educated customers from city compare the prices online before purchasing. They test and see the product on the retail store and eventually buy it from Amazon or Flipkart during sales. Also, the retailers told me several other shops have closed or have cut down on the manpower since the business is becoming less profitable. On the other hand, the repair and accessories sale is a booming market, and there is plenty of margin for retailers. 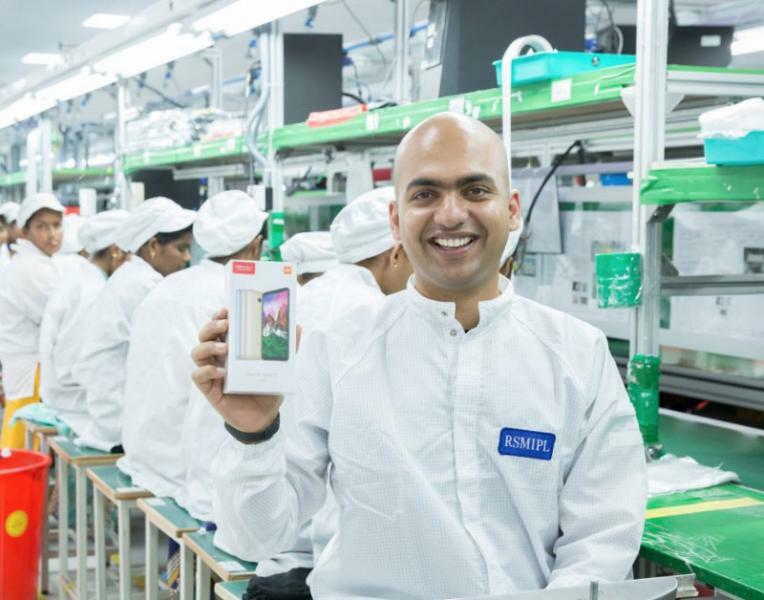 Is Xiaomi Manufacturing phones in India or just Assembling them? I wrote a detailed report on Made in India smartphones, a couple of weeks back. It highlights the fact that most companies are just assembling mobiles in India by importing the parts from China, and Xiaomi is no exception. As per a research by IDC, the value addition done in India is less than 5%. In fact, Foxconn assembles the phones for Xiaomi in India and manages the supply chain, as it does for several other brands. Xiaomi has 5 manufacturing facilities in India and the brand says they employ over 10,000 people in these factories. Also, it claims that out of these 10,000 workers, 95% of the workforce is female, and the brand is contributing to the “Empowerment of Women”. There are some key questions like “How is the work environment in these plants?” As the image clearly shows workers are sitting on backless stools, is it good for their health? As most of these are females is Foxconn paying equal salary as men to these women, who work non-stop in assembling phones for the brand? If the company is taking good care of the employees, then it is a good thing, else there is a need for introspection. In the past, Apple is criticized for using Foxconn, which employes cheap labor under appalling conditions and lower wages. You can read A report by Guardian – Life and death in Apple’s forbidden city. Furthermore, Indian Government is gung-ho on the “Made in India Initiative,” and brands are at times superficially marketing the Assembly in India as “Made in India”. This is absurd as well as misleading. Are we manufacturing PCBs, Displays, Processors in India? No. We may in the future and government is pushing the import duty up to ensure it happens. The government earlier increased the import duty on the mobile phones from 10% to 20% in a hope to push local manufacturing (I mean assembly). In a recent change of import duty on the PCB (Printed Circuit Boards), the government has increased it from 0% to 10%, to further boost local manufacturing. I believe this should be pushed even higher, to force Chinese companies to put real efforts to start manufacturing in India and provide more employment to youngsters of the country. Recently in a press release, Xiaomi promised more jobs in the manufacturing for Indian women. But there are rising concerns about lack of employment in the country. According to the Labour Bureau statistics, India has, today, become the nation of the most unemployed in the world. India needs inclusive growth where a lot of people can earn their daily wages from trade and business to generate employment and growth. You can read the detailed report published by ANI on the unemployment growth in the country. The Growing Concern of After Sales Service? Not only are the concerns limited to employment generation, retailers loss, profits flowing to China and decline of Indian brands. Also, there are several concerns considering the after sales service of Xiaomi. Apple and Samsung charge a lot for their phones but also offer a decent after sales service to the buyers. As long as electronic products work troublefree, life is good. But once you need to visit the service center multiple times for replacement or warranty, things become frustrating. There are complaints about every brand including Apple and Samsung, but there are more concerns against Xiaomi. In the past, there were several complaints about Snapdeal, and we all know where the brand is now. Despite they spent 200 Crore on the futile re-branding exercise. We hope Xiaomi takes some steps to resolve the customer complaints and create a delightful after sales and warranty process. As shown in the above market share graph, there is no Indian brand in the top 5. Below is a market share report from 2014, that we published back then. Indian players like Micromax, Karbonn, Intex has lost significant ground to Chinese players and are struggling. Micromax had an 18% market share and Lava and Karbonn were among the top mobile brands in the market. Everything has changed in the in the dynamic Indian mobile arena in short span of time. It is unfair to blame the Chinese players for the downfall of Indian brands. Indian companies were importing Chinese phones, re-labeling and selling them. There was no focus on R&D. They lost big time with the invasion of low-cost Chinese brands. Moreover, Indian players also never focused indigenous development and bringing manufacturing to India. They were busy in importing, re-branding and selling the Chinese phones. Micromax, once seen as an innovative brand, is now merely looked upon as a Chinese importer by many critics. Nevertheless, the profits that Xiaomi earns from India flows back to China and ultimately strengthen the Chinese economy. Had Indian brands focused on R&D and Indian manufacturing, it would have led to more employment and wealth generation for the country. Is Xiaomi’s Growth Good For India Inclusive? Xiaomi is doing great as a brand in the country and has the strong backing of Mi fans. People love the low-cost phones that offer great value for money. I am a huge fan of Xiaomi phones and love to recommend them to the buyers over other brands. The issues discussed here, are more macro and raised by several of our readers in emails/comments. Also, the recent market visit and meeting with several retailers, incite me to write this story about How Xiaomi is impacting the Indian mobile arena. There are always two sides of a coin, one we see, and the other that is hidden. Sometimes it is important to throw light on the hidden side and bring it in public view. Not only Xiaomi, there are growing concerns behind the success stories of major technology companies. Recently, Google lost an anti-trust case in India and is fined Rs. 200 Crore and FaceBook stand in the eye of a storm, accused of misusing user data. These giants are becoming more powerful day by day, dwarfing the humble competition, with their massive wealth and resources. There is a need for companies to look beyond their own benefits and have an inclusive approach to help employees, channel partners, retailers and others grow for a sustained future. It’s really good to know both sides of the Xiaomi Company and its bussiness model! and Kudos to the writer! Very well written article with to the point, unbiased report on Xiaomi!